Okay so this is just a random post about exams, revision and coping with the stress that comes with it. I know a lot of people have exams or essays due in at the moment so I thought I give my tips and let people know how I revise as it might help someone or give someone ideas on how to deal with the stressful time that is the assessment period! 1. Plan! Look at how much time you have and work out a feasible revision plan, factor in breaks and downtime, do not try to work all day everyday, you won't take the information in and you will run yourself down. 2. Breakdown information into main themes/topics. I like to put the main themes down on a page and then make broad notes for each theme. Once i've done that I then reduce the notes onto small notecards like in the photo to give myself bitesize information to read over. 3. References/Sources. If like me you have to remember who said what or dates then do separate notecards with the person's name or date and then a small heading of what they said for example one of my psychology notes is - Holmes, Holmes and Tewkesbury - Fractured Identity Syndrome. Nothing more than that,basically flashcards, something to jog your memory. I also do lists and test myself by writing them out again. 4. Use coloured pens and highlighters! First off its more interesting to look at meaning you will take more in if your brain is associating colours with names and topics. Secondly its just fun and swapping pens makes writing things down slightly less tedious! 5. Take regular breaks! Do not sit all day staring at your notes, the mind doesn't work like that, concentration starts to drop after about 20 minutes, I tend to work for 45 minutes and then stop for fifteen, i'll get a cup of tea or just stand up and walk around. Have a look at Facebook or read some blogs. It refreshes the mind and eases tension. 6. Eat and drink. Make you drink plenty, I always have a glass of water or squash while i'm revising. Also have regular meals and try to keep it relatively healthy, fruits, veggies, protein all good to keep you active. 7. Be good to yourself! Try not to berate yourself by saying 'i've not done enough i'm going to fail', you create a self-fulfilling prophecy. You wouldn't say to a friend 'oh you've not done enough you'll fail' would you? So don't say it to yourself. Remember you are only human, you won't remember everything but that's okay, the examiners do not expect you to, it would be physically impossible. Say to yourself 'I do know this, I have looked at it, if I forget a couple of things its not the end of the world'. 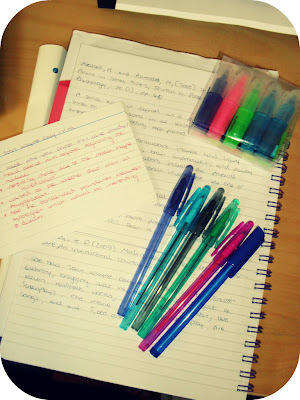 Those are my main tips for revision, things that I try to stick to whilst studying. Now i've always found exams stressful and a few years ago started having panic attacks, the first one bought on by an exam I felt I couldn't do. I'd got it into my head that I couldn't do it at all and it went all downhill from there. If like me you are a very anxious person and if you suffer from panic attacks here are some tips (now this is just my personal experience, it might not work for everyone just bear that in mind). 1. Get enough sleep. If i'm tired my anxiety hits the roof, because I feel I can't concentrate and start to get worried that i'm taking in information. 2. Take deep breaths. If I feel any sort of anxiety or panic building and try and sit back and just close my eyes and take some deep breaths, it gets the oxygen flowing and makes you stop thinking a mile a minute. 3. Steer clear of caffine! A big one for me, coffee, energy drinks and pro-plus all set me off, I don't drink any coffee or energy drinks in the days before my exams. It enhances the feelings of anxiety so I try to avoid it like the plague come exam period! 4. Take a walk. Fresh air is the key, i'm a huge believer in getting fresh air everyday...now I live in a big city so the word 'fresh' is relative haha, but it clears your mind, takes you out of your room with all your work in and lets you focus on something else for a little while. 5. Treat yourself. You don't have to wait until after your exams. Have a cupcake, go for a meal, buy something you've seen, take a relaxing bath, see a friend. If you've spent the day revising, take the evening off and watch TV or go and see a film. Honestly its the best thing you can do to refresh yourself for the next day. I tend to do around 5 to 6 hours of revision a day, broken up mind you and in the evenings I try not to do any. 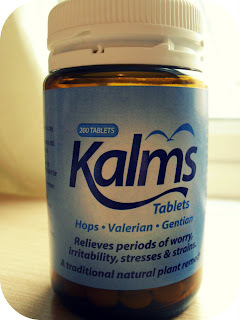 For me they do what say on the tin, I find that the anxiety becomes more managable, its natural to be worried about exams but these help to keep the worry at a normal level so it doesn't become overwhelming. They are natural and you don't need a perscription to buy these. I buy mine from Boots and they are £6.85, but so worth it. I don't take them everyday only if I feel particularly stressed or nervous, but they have definitely helped me! So there you go, my tips for less stress around exam time. If anyone else has any good tips they want to add that would be great :). I hope everyone is having a good day and good luck to all doing exams and essays at the moment! Thanks for this post it's helped a lot! 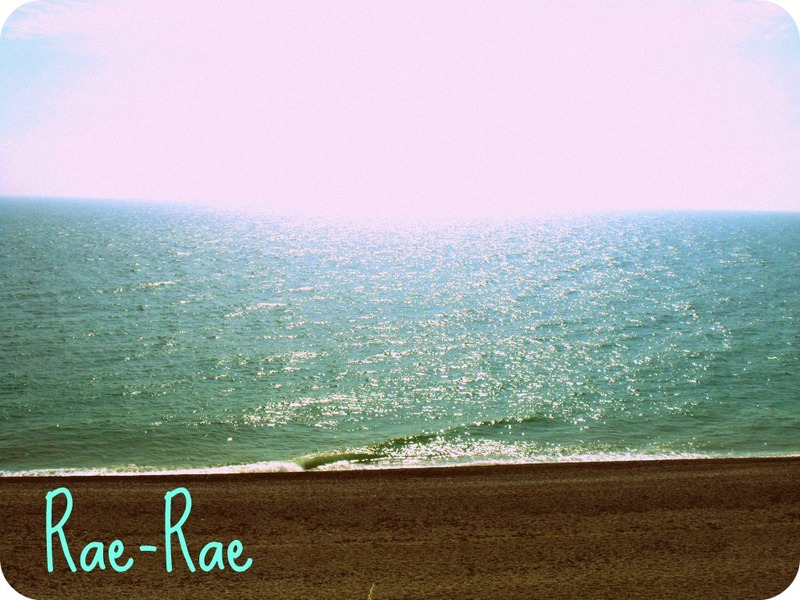 I would love to follow your beautiful blog! <3 maybe we can follow each other?